DLP connections protect crooked Barbados lawyer from arrest? Why was Michael Simmons so confident he wouldn’t be arrested? Everybody knew that fugitive Michael Simmons (photo above) was coming to his sister’s funeral last weekend, and everybody was just as sure that he wouldn’t be arrested for the crimes that caused him to flee Barbados 18 years ago. What’s changed in the 18 years since Simmons stole millions and ran off? That’s easy: some of Simmons’ family members are now close to the DLP Government. Reader “Who me?” saw the article in The Nation Simmons back after 18 years and sent us the following contribution. BFP readers should remember that just because someone says something, doesn’t mean it’s all for true. But there does seem to be a whole lotta smoke ’bout this place recently! Justice? Rule of Law? For some but not for others. The Nation article about Michael Simmons caught my eye in that I was made to understand that transparency and corruption and the relevant legislation were major concerns for Barbadians, having being promised this by the DLP government of the day. Lots of smoke ’bout this place! 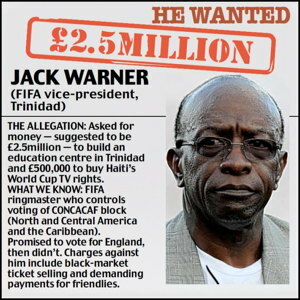 It was only days ago that the story broke of bribery allegations against Jack Warner and three other FIFA officials in relation to England’s failed 2018 World Cup bid. Today’s breaking story is about a NEW, completely unrelated bribery allegation surrounding the upcoming FIFA presidential election! “On May 24 2011, Fifa executive committee member and Concacaf general secretary Chuck Blazer reported to Fifa secretary general Jerome Valcke possible violations of the Fifa code of ethics allegedly committed by officials. “In particular, the report referred to a special meeting of the Caribbean Football Union (CFU), apparently organised jointly by Fifa vice-president Jack A. Warner and Fifa executive committee member Mohamed Bin Hammam, which took place on May 10 and 11 2011. “This meeting was linked to the upcoming Fifa presidential election.